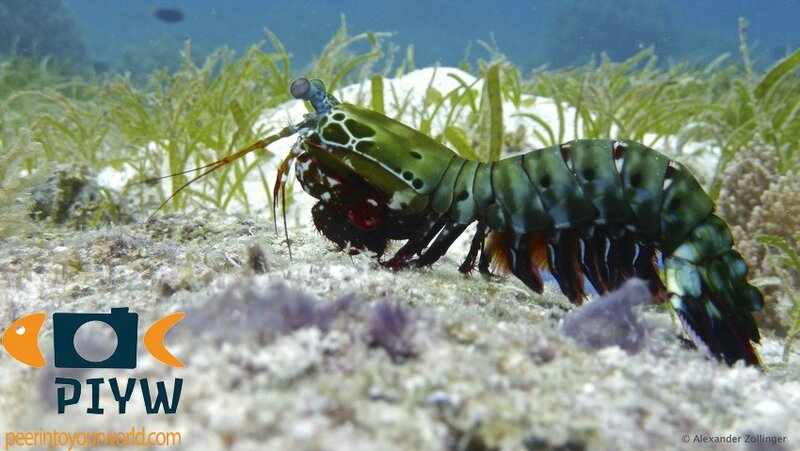 Large shrimp, olive to dark green body, orange/yellow antennal scales with red borders. Blue eye stalks with large eyes and dark blotches on the upper front side of the carapace (just behind the head). They are shy and can move very fast. 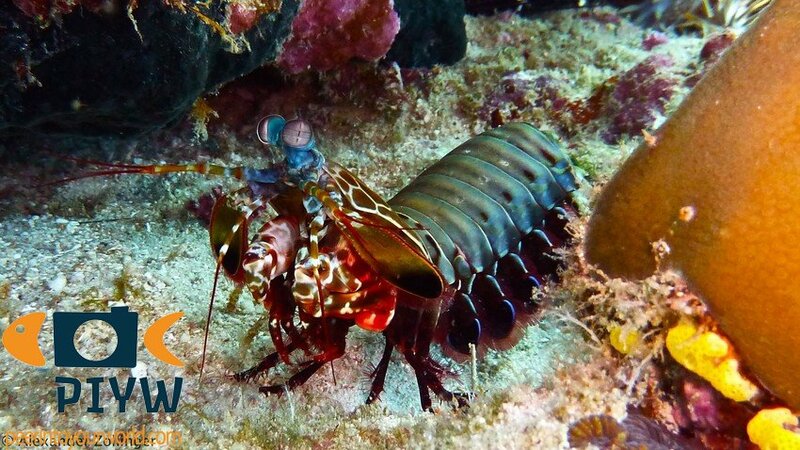 Unassessed by the IUCN Red list, but a common species of mantis shrimp in the Indo-West Pacific; Indonesia to Guam and Eastern Australia. 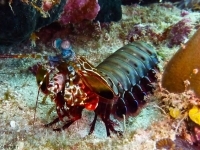 It can be found in parts of the Indian Ocean, but mainly in the Indo-Pacifc and West-Pacific. They live in or around their burrows in reef-associated areas, on or near coral patches and reef flats, in a depth range of 0-100 meters. 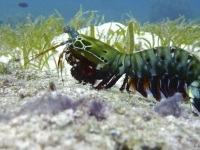 Mantis shrimp that use smashing to hunt are found away from their burrow, mantis shrimp that use spearing to hunt are found close to their burrows. Some members of the order Stomatopoda pair for life and some come together only to mate. Females can brood a maximum of 50,000 eggs. Eggs hatch to planktonic zoea which last for 3 months and then settle on the bottom. They feed on scyllarids. They use their blunt appendages to serve a knock-out punch to their prey. The impact is so loud, it can be hard by divers from far away, and it will kill the prey by sheer pressure. O. scyllarus is strongly resembled by O. latirostris, but that has pink/purple antennal scales and rougher scale plates than O. scyllarus.